Our school workshops are fully interactive and can last anything from 30 mins to 2 hours with one group of pupils. We tailor our workshops to suit all age groups from 4 years up to young adults at 18 years. 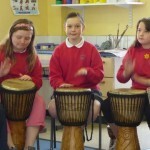 They are lively and energetic keeping pupils focused as they learn traditional African rhythms. 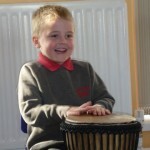 We offer drumming only workshops, where every pupil is equipped with their own drum, hand percussion are also available. Or we can combine drumming and dancing for groups of up to 60 pupils. Half of the group will learn a dance to accompany the rhythm which the other half of the group are learning on drums. 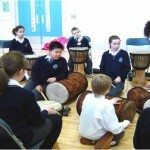 The pupils then swop over, so every pupil will have a chance to drum and dance. The finale makes for a very entertaining performance for parents and the rest of the school!